I have to say I am on the fence with regards to getting a rocker. Since this is my first baby I can't say whether or not I will use one. And I hate buying something I have no idea I will use. Half of me wants to just scrap the idea and get a twin sized bed instead. But in the back of my head I keep remembering a piece of advice I received recently from a friend who has three little ones. She said I should definitely get one, but splurge and make sure it is something that will look good outside of the nursery. Something I can use in the kitchen or living room after the baby is grown. Something that doesn't look like a rocker used for nursing (if that makes sense!) So... going with that bit of advice, I have compiled this lovely list of favorites below. I am currently leaning towards the Luxe Glider by Jennifer Delonge (no. 4) which I would cover in a flax colored linen (similar to no. 1). But, I have always wanted an excuse to buy the Eames Molded Rocker... and what better time than now!? Hi! I am forced to introduce myself as a blog stalker :) of your great blog. I have to give you a tip on the best rocker (identical to pb kids) on walmart.com. It is slipcovered and I forget what it is called but it comes in cream, pink, butter, and chocolate. It's 160 for the chair and another 100? for the slipcover. It is TDF! Yes Yes Yes! After having 2 little ones I swear by it. And I wanted to same for my house. It was something that was honestly a necessity. I recommend the twin bed as well! But FOR SURE the glider - you will not be let down. And I recovered mine with each child! I recommend one with some kind of foot stool. Your feet won't touch and your knees will need the support. THANK YOU!!! i really appreciate any advice as this is all new to me. and i love the price :) thank you again!! one question - did you get a foot stool that moved with your rocker/glider? I agree with your friend that you should get one, and that it should be a piece of furniture that you love. I have a small, non-nursing-like upholstered glider that has lived through two kids, and I can't see any reason to take it out of their room though I haven't nursed for years. We use it every day for reading and for adults to just sit comfortably in their room. I did not get a footstool because of space issues, and I've never regretted it. It would be in the way all the time even if the room was larger. 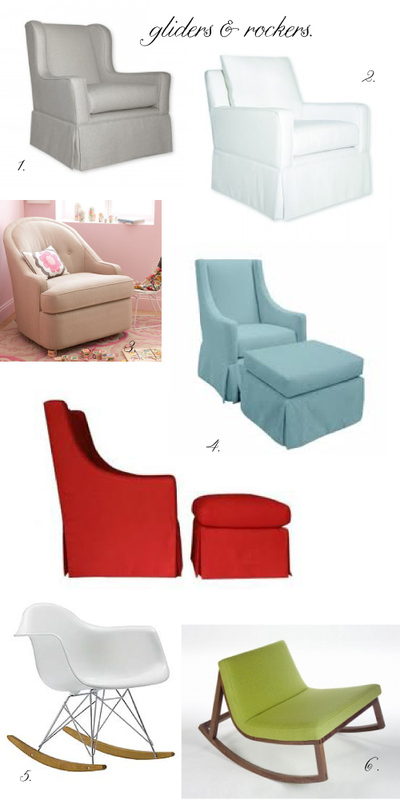 And though I also love the eames and the camila rocker, I would recommend padded arms of some kind. You need the support when nursing. Have fun shopping!